ESL printables helped me to become more creative and give a new sense to my life as a teacher ! I love sharing.My priority is to find innovative ways to motivate my students. English is not exactly their cup of tea ! Thanks to all the members who have taught me so many things. Some have unfortunately left us. They left sadness but also Fortune behind ! Watch and listen to this little masterpiece (youtube link included). This is a relooked Re-Load. Hope you will like it this time ! My pupils love it ! There is a gap-fill ex + transcript + vocabulary matching exercise + KEY. 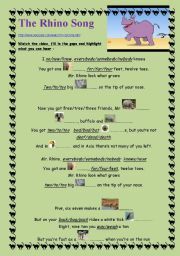 This can be used as an ice-breaker or to focus on jungle vocabulary, homophones and spelling. Wish you succes with it ! 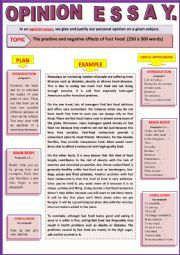 Opinion Essay - The positive and negative effects of Fast-Food. - Guided writing + Example. Our students need examples of essays. They also need to be guided and given tools such as connectors. Motivating topics can also be helpful. So this is an example. This is a funny picture that I use when dealing with HOMELESSNES. First I start with Phil Collins� popular "Another Day in Paradise" + comprehension exercises. This picture is a funny contrast to the sad beggar in Phil Collins� song. It usually works very well with the students and makes them want to react. Hope you will like it too ! 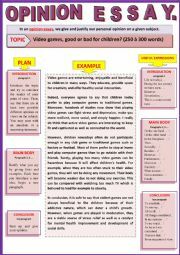 Opinion Essay - Video games, good or bad? - Guided writing + Example. Opinion Essay - What is your opinion on space exploration? - Guided writing + Example.